Little House Home Arts: Who Would Have Thought? A few weeks ago now, we discovered that even after changing our cat litter box, our pantry/ laundry-/ mud-room, still smelled like cat pee. Changing the cat box has been a duty relegated to my poor husband and he kept attesting to the fact that he had, in fact, just changed it, and couldn't imagine why it smelled so strong. 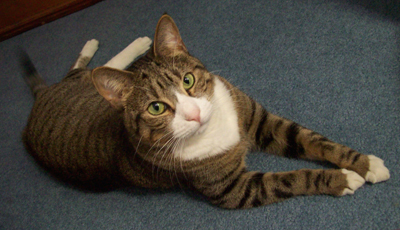 We have had pet cats for many years and so we knew to watch our cat for signs of illness, as sometimes a UTI (urinary tract infection) may cause a strong odor, but Zeldie, our cat seemed just fine. 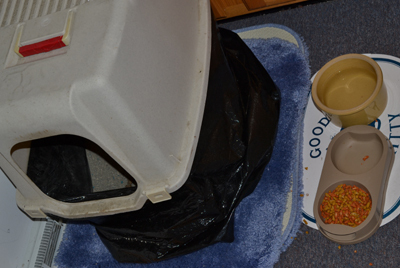 We also use plastic bags to line our litter box to keep the bottom clean and free from residual odors. I am ashamed to admit that when things don’t seem right, it is always easy to blame my husband and I figured that he wasn't rightfully calculating the time intervals between litter box changes? 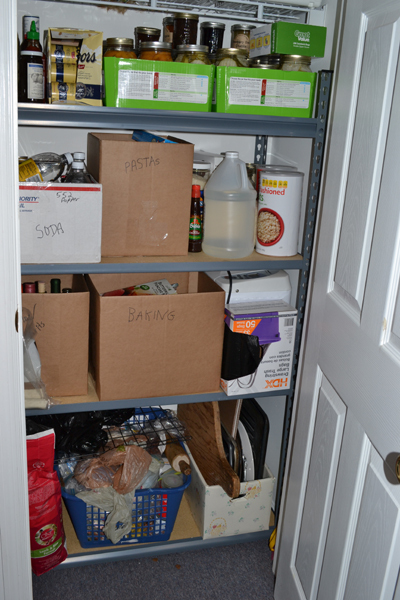 Not long thereafter, my husband noted that when the pantry door was open the odor was worse. I went investigating and noticed that the bottom board of a small shelf unit in the pantry closet appeared wet and called my husband from his peaceful evening of TV watching and we proceeded to pull everything out of the pantry closet, no matter that it was 11:30 at night and we were ready to head for bed instead! We discovered that a two and a half gallon jug of water we had on the top shelf had gotten a bit crushed, creasing the bottom and causing it to leak. It had leaked onto the top shelf and then down the back of the storage unit until the whole little particle board cupboard was wet. It was so saturated with water that my husband could hardly carry it to the garage. Hugging the shelf as he carried it out, my husband got a good whiff of the stinky shelf! We had definitely found the problem. We shut the door to the mud room after setting up a fan in the window to dry out the carpeted floor of the closet and with our salvaged dry food items tucked safely into boxes, went to bed. The next day, I got on line and queried about wet particle board and there it was....wet particle board/ and/or wet plywood sub-flooring will cause a smell just like cat pee! It is actually caused by the glue in the board getting wet. The carpet floor of the pantry closet was wet and so I feared the worst, especially as the days went by with fans blowing to dry the carpet and the smell lingered. I called our insurance company, for I was afraid that the walls and or the wood sub-flooring had gotten wet and according to articles on line, the only way to rid the house of the smell might be to strip out the wet sub-flooring or even wallboard to prevent it from causing black mold. We continued fan drying the closet and kept the door shut to the rest of the house as we considered our next plan of action to address the lingering, albeit fading noxious odor. My husband thought that steam cleaning the carpet was next, though I wasn't so sure that this alone would deal with the smell, and so we compromised. He lifted the carpet in the closet and found that the pad under it was retaining water, making the sub-flooring wet as well. He then cut out the carpet pad in the closet and we continued to try to dry the wet sub-flooring. Fortunately the smell went with the pad and when the floor dried, it had no odor. He then replaced the carpet padding and laid the newly cleaned carpet back down in the closet and replaced the cupboard with better a better fitting shelf unit. We were delighted that costly mold experts or contractors were not needed to fix the problem.